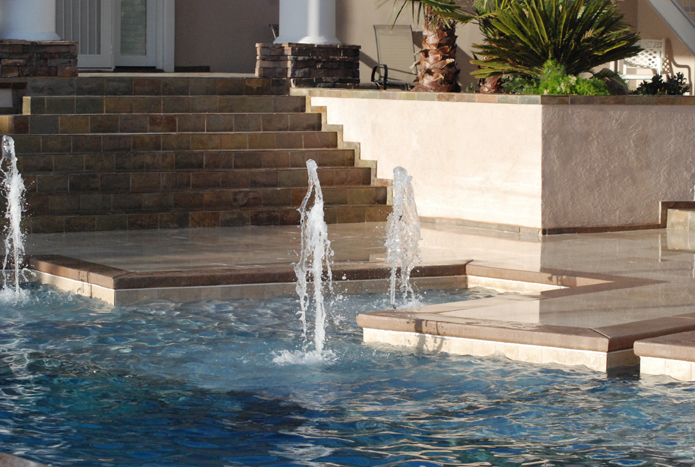 A Beach Entry or Zero Entry is a gradual slope descending into the pool in the manner of a natural beach. 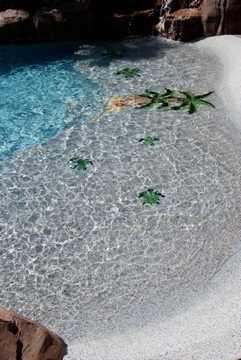 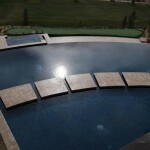 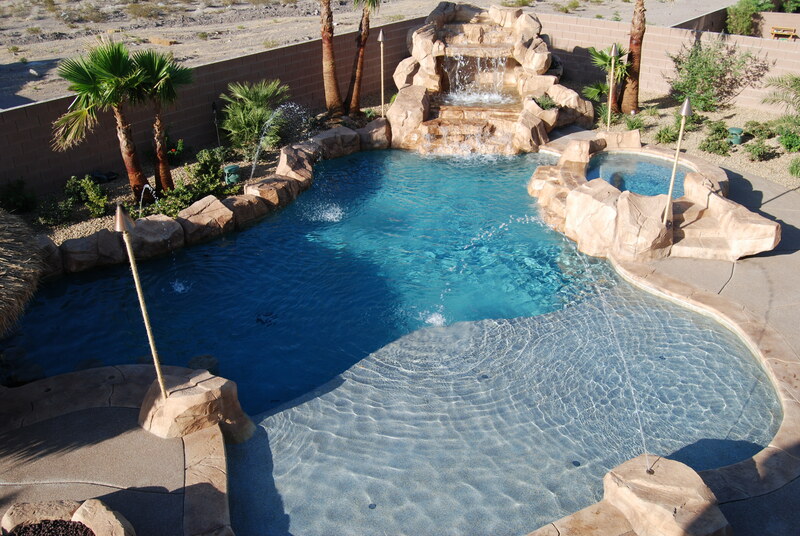 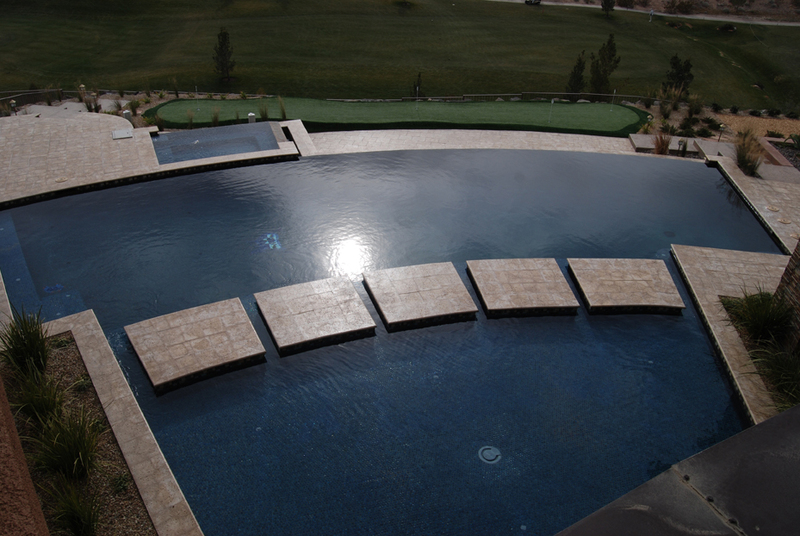 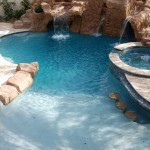 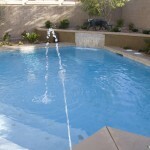 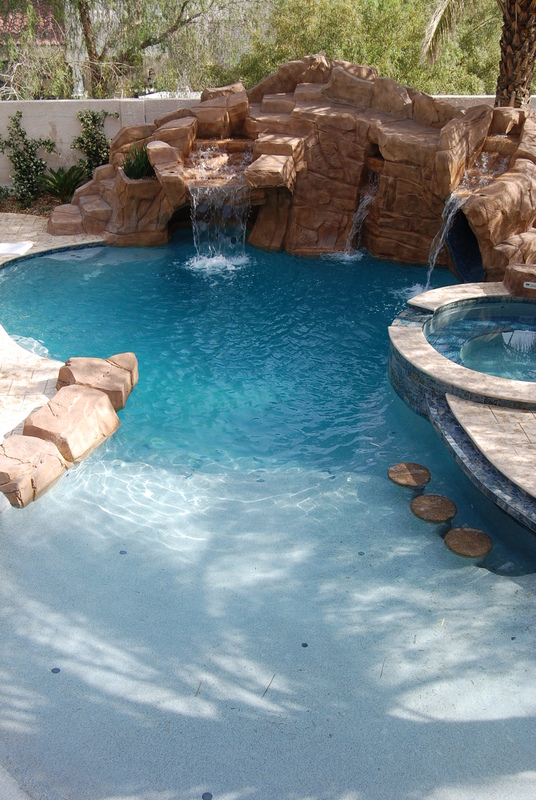 Often an aggregate material is used for the pool’s interior finish to resemble sand and complete a tropical theme. 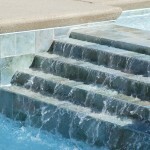 Beach entries are ideal for those individuals that have difficulty navigating steps. 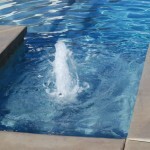 A Wet Deck (also referred to as a Thermal Ledge or Baja Deck) is an extended or oversized step within the pool usually large enough to place a couple of chairs. 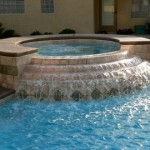 It can be submerged at various depths to best accommodate the family. 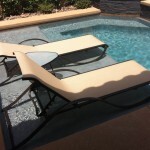 Installing an umbrella sleeve during the construction allows for removable shade while enjoying the refreshing water. 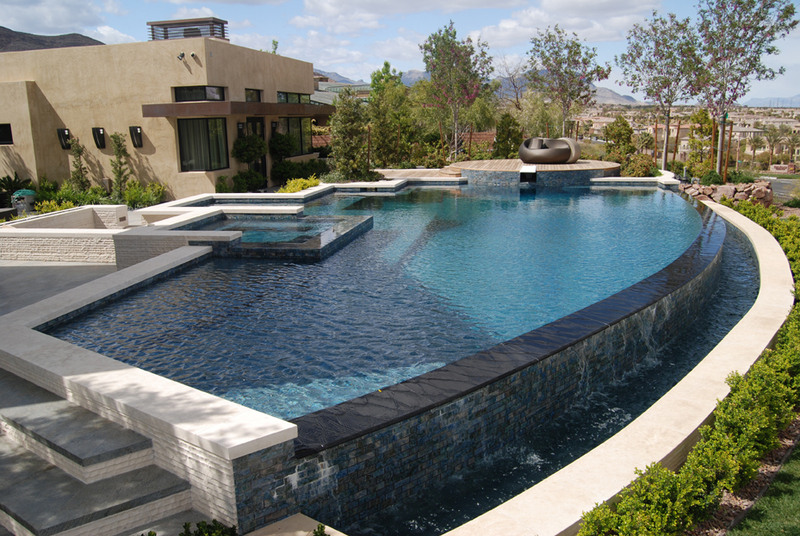 An Infinity Edge (also called Negative Edge or Vanishing Edge) is a pool with the visual effect of water merging with the horizon or extending to infinity. 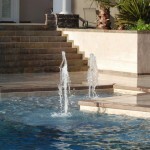 Often the water appears to vanish into thin air or fall off the edge of the property. 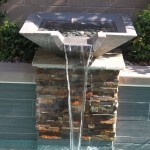 Viewed from the other side, the spilling water and catch basin can become another beautiful feature of water in motion. 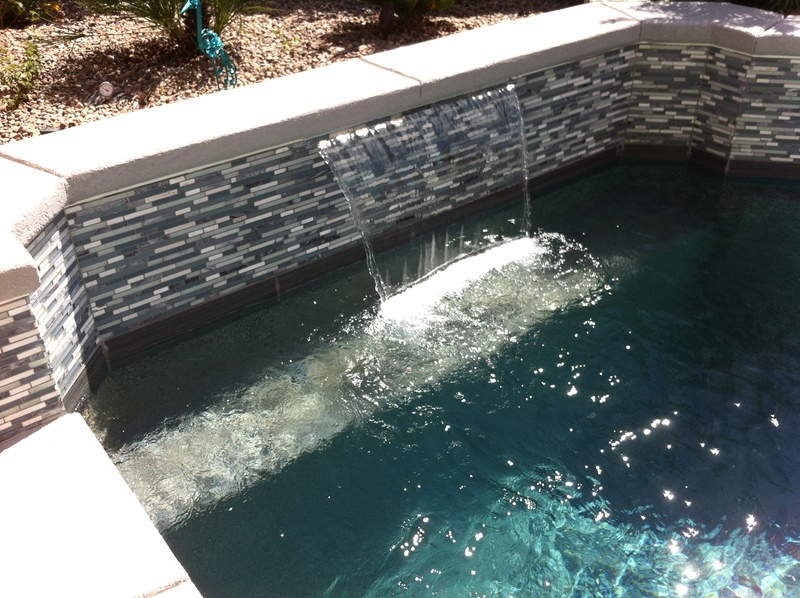 The sights and sounds of moving water greatly contribute to mood and style whether subtle or bold. 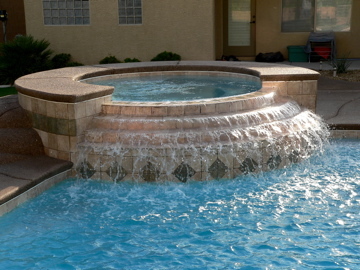 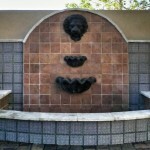 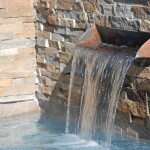 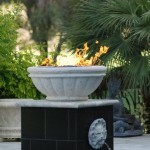 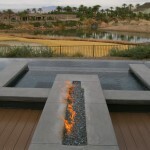 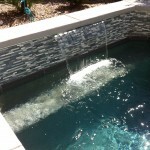 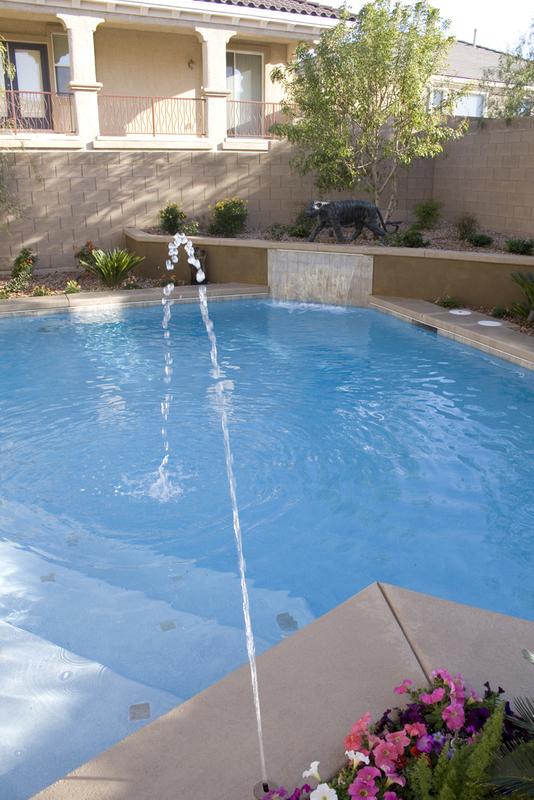 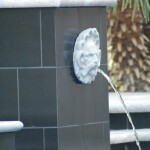 Cascading Spillways are ideal for creating a waterfall effect with multiple changes in level. 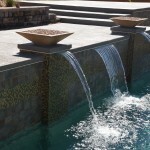 Added to one side of an elevated built in spa allows warm water to flow into the body of the swimming pool. 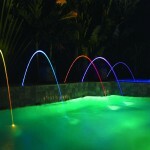 Operated by a multiple speed pump, the feature can increase in intensity from a gentle trickle to gushing. 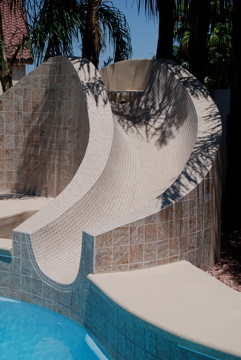 Incorporating a Slide into a waterfall is a great way to add entertainment value to a swimming pool without disrupting the visual appeal. 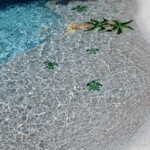 Hidden grottos and caves are also a favorite among children and adults alike. 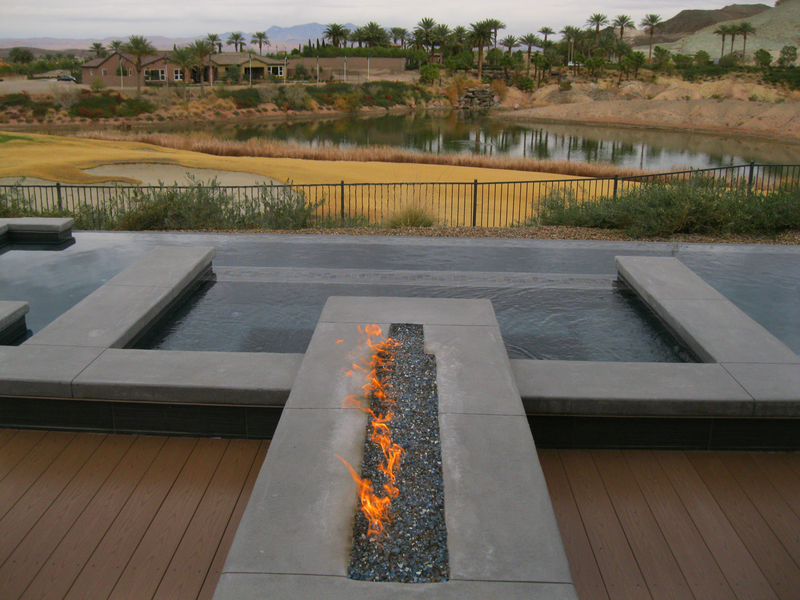 For the contemporary look, a custom feature can be designed to suit your personality and taste. 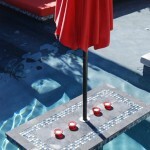 Floating Pads and Floating Tables don’t actually float since they are made of concrete, they are just built to appear that way. 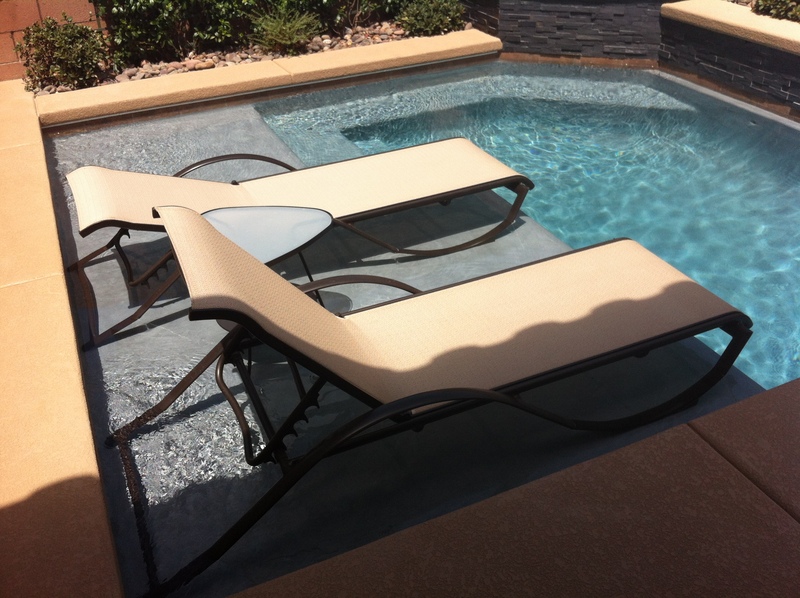 Underwater Seating usually accompanies a floating table, but may be installed for a swim up bar or dining center or simply as a resting bench for swimmers. 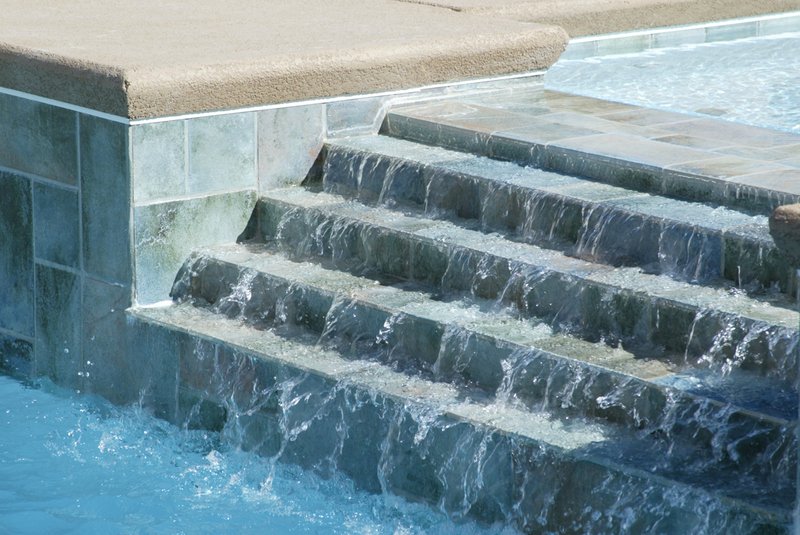 A Sheer Descent, whether installed on a straight or curved edge, creates a sheet or curtain of falling water while a Rain Descent gives the appearance of individual strands. 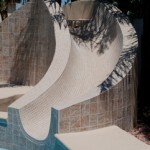 Concealing the feature under the pool coping adds an unexpected dramatic visual element. 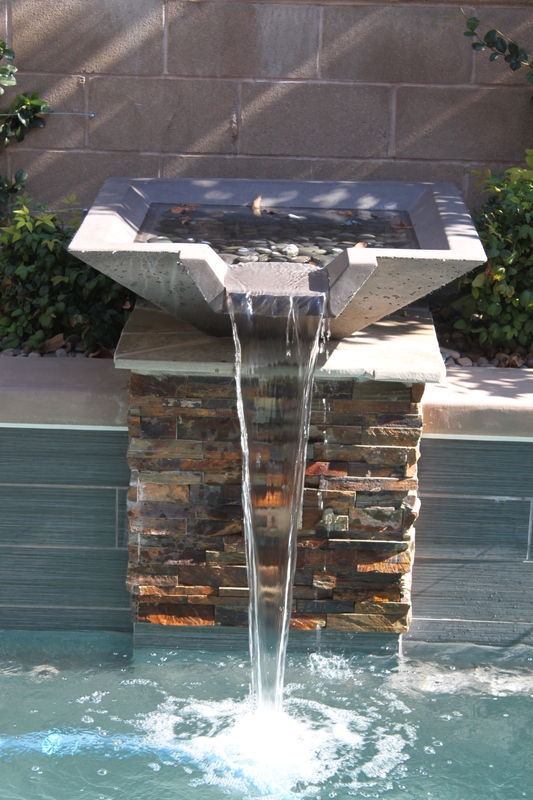 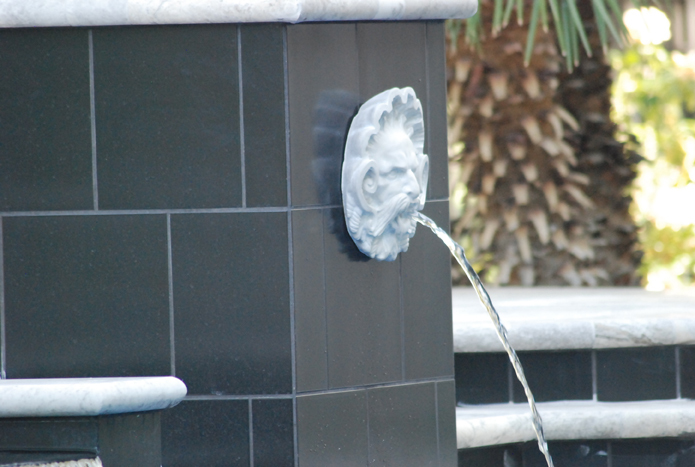 Fountain Bubblers can shoot water upward in the manner of a geyser from a few inches to several feet above the waterline. 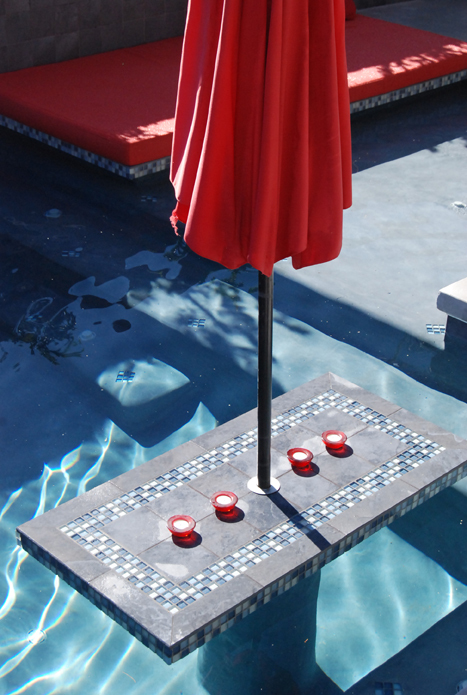 Positioned within a wet deck, they are a favorite among small children. 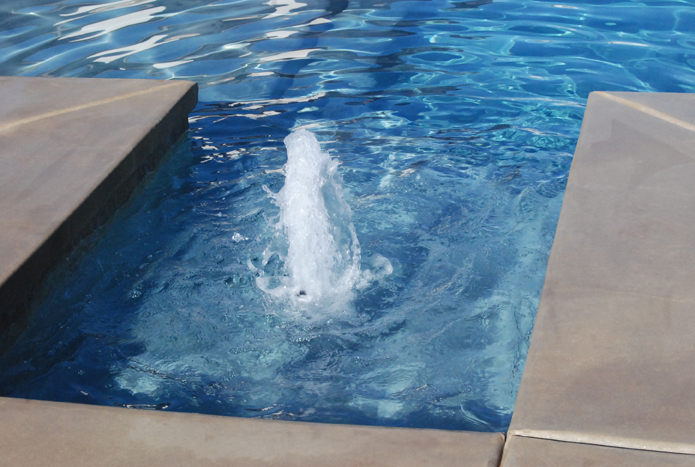 Deck Jets are installed flush to surfaces such as concrete decks or gunite pool walls and spout a graceful arc of water, some reaching eight feet, before splashing down. 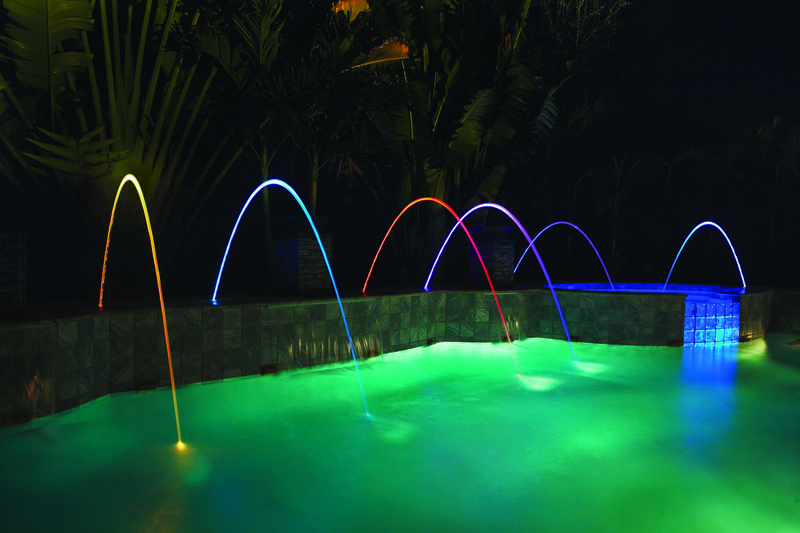 Laminars are like deck jets, but the stream of water is smooth and defined more like a glass tube and vibrantly colored for dazzling nighttime displays. 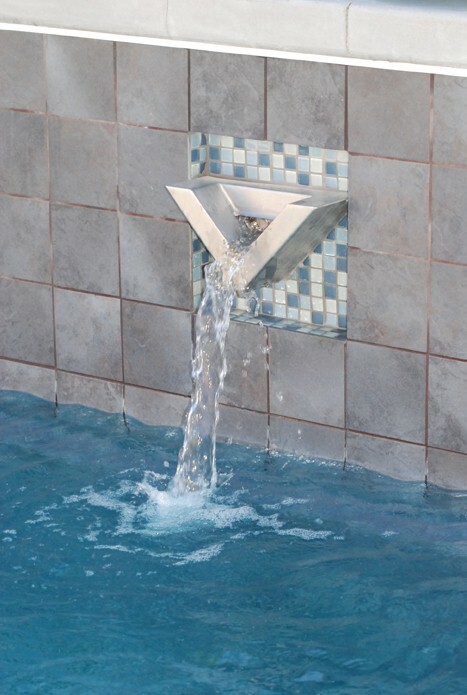 Scuppers are mounted perpendicular to a wall and form a ledge or shelf that carries the water to a basin below. 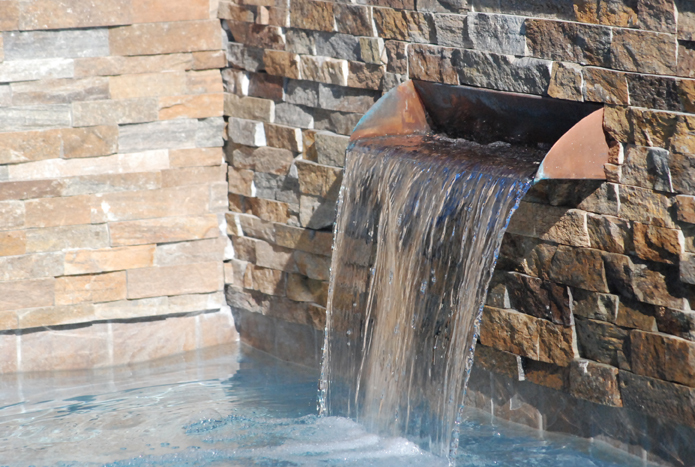 Generally made of chemical resistant copper or stainless steel, they are available in a wide variety of shapes and sizes. 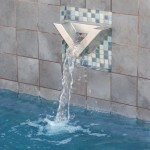 Water Sconces are actually decorative accents that mount flush against a wall and spout water. 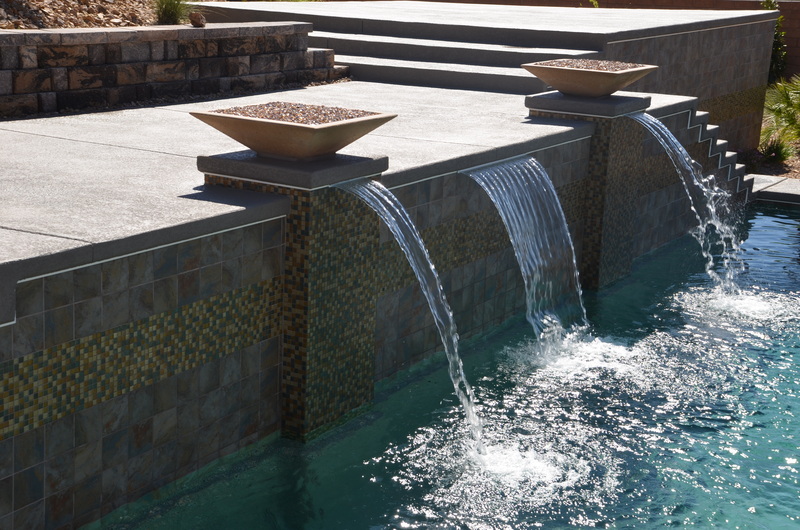 From ornate and detailed to simple and contemporary, they are manufactured in a wide range of architectural styles and materials and certain to suit any personal taste creating the perfect finishing touch. 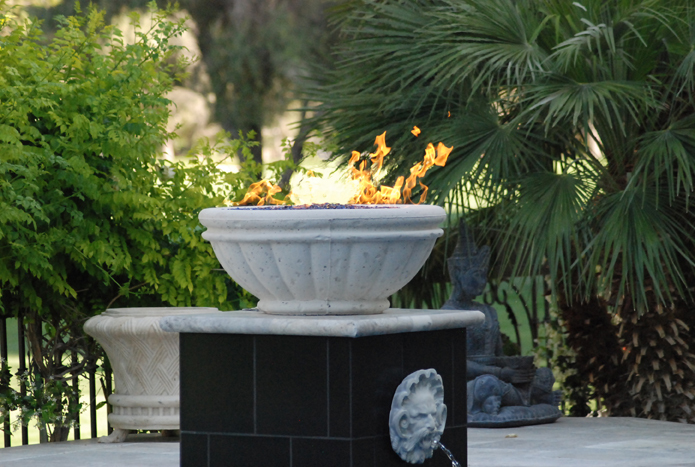 Wok Pot or Wok Bowls are vessels placed on the edge or near the pool that contain plant material, flames of a fire feature or water that spills into the swimming pool. 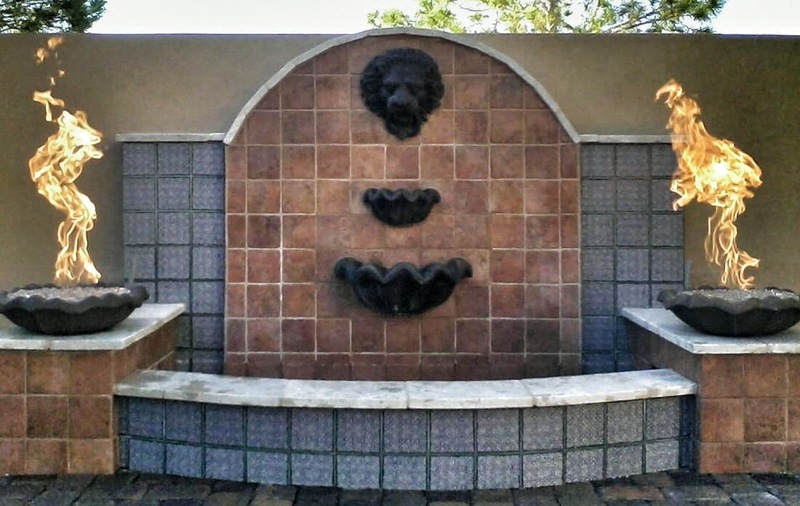 Most often manufactured of precast concrete, they can come in an assortment of materials such as metal or stone and styles from simple to ornate.